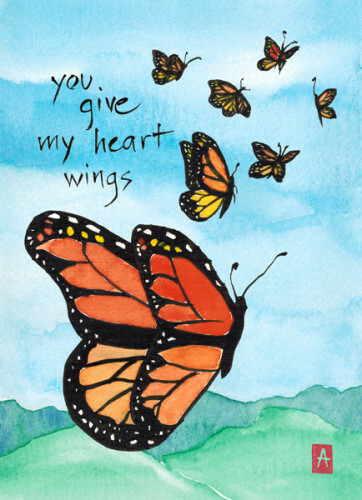 “you give my heart wings” is 5×7, painted with sumi ink and Japanese watercolors on textured paper. So for now, having just flown across most of the Pacific, I am sharing this haiku sequence about air travel, along with a couple of paintings about flying. Enjoy! “body lands safely” is 9×12, painted with sumi ink and watercolors on rice paper. It was published in Contemporary Haibun 13 (April 2013). Hungry Ghosts: Thanks to everyone who came to the opening of this group show! What a fun (and crowded) evening! The exhibit, featuring artists with Asian and Pacific Islander backgrounds, runs through April at the Brenda Tuxford Gallery, upstairs at 325 2nd Street in Eureka, California. Open Studios: Join silk painter Tina Gleave and me for the first weekend of North Coast Open Studios, May 31 and June 1, at the Samoa Women’s Club in Samoa, California. Also, there is a group show of Open Studios artists with a reception at the Brenda Tuxford Gallery on Saturday, May 3, 6-9 p.m. during Arts Alive. Portland and Mendocino Stores: Two discerning new businesses are now carrying my cards: Oblation Papers & Press in Portland, Oregon, and The Stanford Inn by the Sea in Mendocino, California. Traveling: As I am traveling for most of the rest of this month, my Makino Studios Etsy shop will be closed April 5-29. I’m sorry for any inconvenience.